It was a strange choice for a follow-up to his big comeback Academy Award winning role as Maggio in Fred Zinnemann’s From Here to Eternity, but Frank Sinatra was never one to do what was expected. Released in 1954 by United Artists, Suddenly is a tale about three hired killers who come to the small California town of Suddenly with plans to assassinate the President. Written by Richard Sale, arguably best known today as the director of an early film, Let’s Make it Legal, that had a young Marilyn Monroe in its cast, Suddenly is a tight little thriller with a surprisingly nasty performance from its star. The post-Oscar years were busy for Sinatra. That same year of 1954 also saw Young at Heart, with Doris Day. In 1955, came Not as a Stranger, Guys and Dolls, The Tender Trap and The Man with the Golden Arm, the last for which he would receive another Oscar nomination. A mixed bag for sure. And he had some others coming up in the near future (High Society, Pal Joey, The Joker is Wild and Johnny Concho) Frank wanted the role of Terry Malloy in On the Waterfront, but lost out the Marlon Brando. Sam Spiegel, the producer of Waterfront, wanted Brando and Frank for the role of the priest, ultimately played by Karl Malden, which Frank declined. (1) Sinatra resented Brando, so it was surprising when just a year later they co-starred in Guys and Dolls. 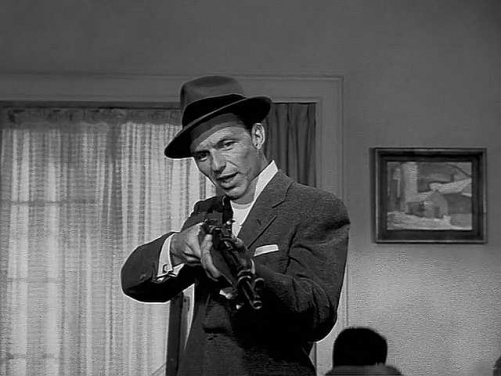 For Sinatra, John Baron was the most evil, psychotic role of his entire career. As Baron, he and his not too bright thug partners Benny (Paul H. Frees) and Bart (Christopher Dark) arrive in the sleepy little town of Suddenly with plans to assassinate the President when he arrives later that same day by train for a short stop-over before going on to Los Angeles. It’s not political, for Baron and his men. For them, it’s strictly for the cash. A half million dollars. 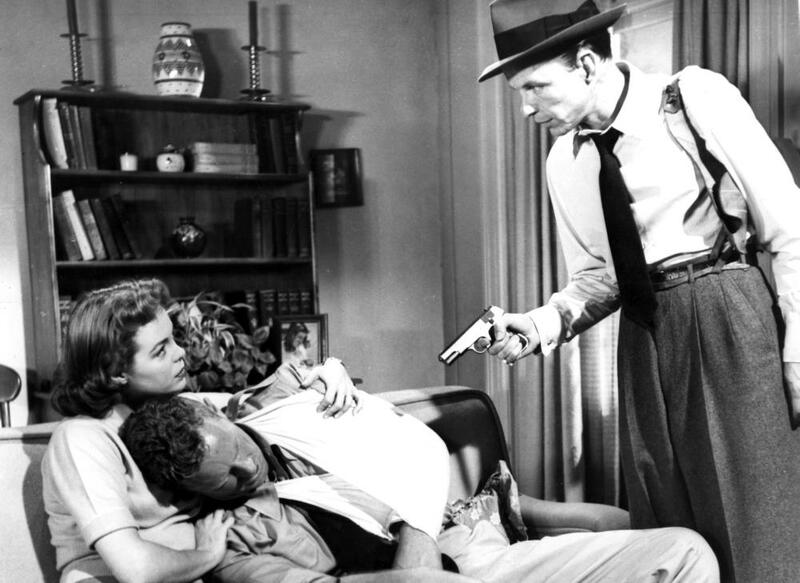 In town, Sherriff Todd Shaw (Sterling Hayden) has been unsuccessfully trying to get together with the young and pretty Ellen Benson (Nancy Gates), a widow whose husband died in the war. 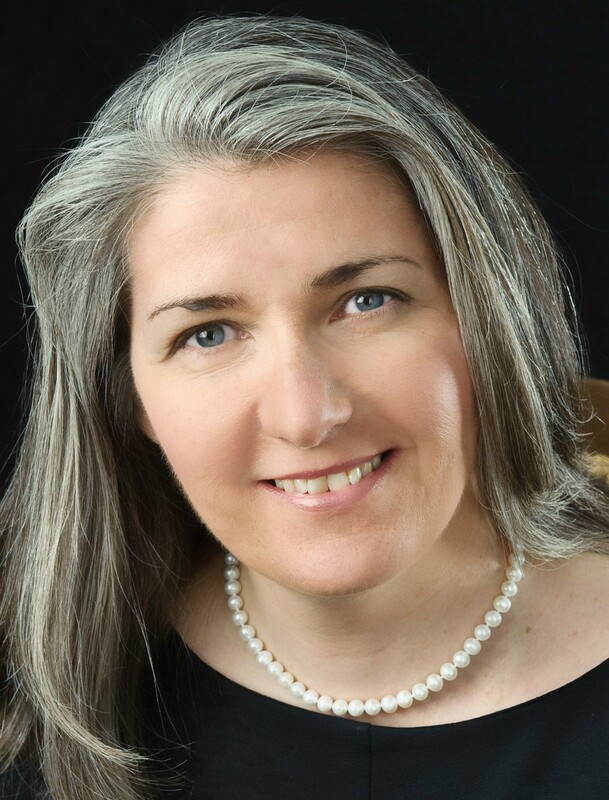 Ellen hates guns and will not even let her young son Pidge (Kim Charney) go see a war movie or own a cap pistol. Though, early in the film, we see Sherriff Shaw buys Pidge one, not telling Mom. 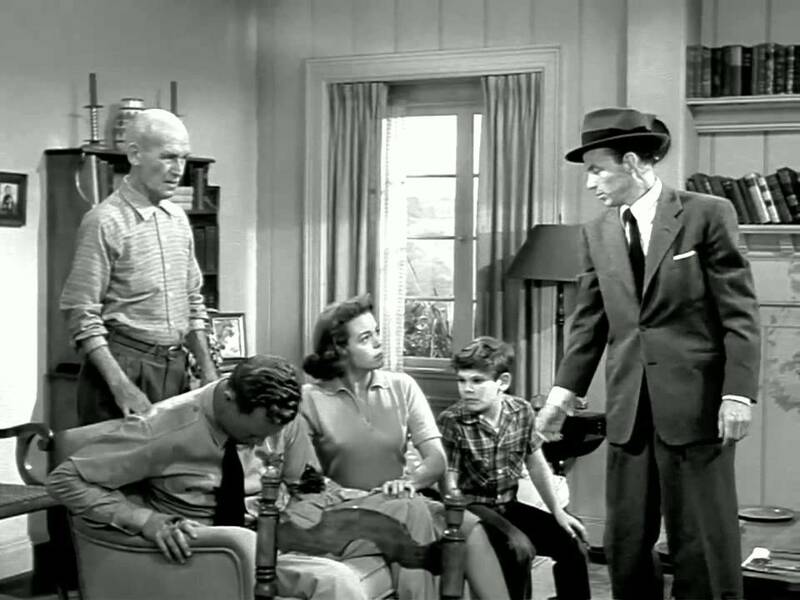 Ellen and the boy live with her father-in-law Pop Benson (James Gleason) in a house, owned by Pop, nearby the train station, a perfect distance for someone to shoot a person coming off the train. Shaw has been notified of the President’s arrival by the State police, as well as the Secret Service, headed up by Dan Carney (Willis Bouchey). Upon his arrival in town Carney wants all the stores near the train station checked out, for security reasons. He also wants the nearby house, owned by Pete “Pop” Benson, checked too. When Carney hears from the Sheriff that it’s Benson who owns the house, he realizes, it’s his old boss. Old Pop it turns out, is a former secret service man himself. Baron and his two men, posing as F.B.I. agents, maneuver their way into the Benson home holding the family hostage. When Carney arrives to check out the Benson house, and say hello to his old boss, with Sherriff Shaw, the agent is quickly shot and killed by Baron. Shaw is also shot, wounded in his arm. Baron quickly makes it known he has no problem killing anyone in the house, even young Pidge who he states would be the first to die if anyone gets out of hand. With the clock ticking toward a five PM arrival of the President, the film turns into tense, gripping psychological battle as Shaw attempts to find Baron’s weak spot and take advantage. He does. Baron’s weak spot is he likes to talk about himself, and his military record. He’s a bitter man. He likes bragging that during the war he killed 27 of the enemy all by himself and received the Silver Star. Shaw tells him he found his calling in life. He’s good at killing. The Army rewarded him with a section 8 discharge. Sinatra is simply superb proving From to Eternity was no fluke. Bosley Crowthers of the New York Times who gave the film a mixed review did get it right about Frank’s performance. Whoever is financing Baron is well connected. They know the President’s itinerary, they got money and a plan. Baron and his boys are basically stooges for something bigger. The film can be looked at as a sign of things to come. The picket fence world of post war America represented by the sleepy town, is about to get one of its first cracks. America were on the verge of seeing lot more of John Baron types. Over the years, it has been written, rumored that after hearing of President Kennedy’s assassination Sinatra (he was filming Robin and the Seven Hoods at the time) immediately pulled this film and the 1962 John Frankenheimer film, The Manchurian Candidate, from circulation. This is false. Anyone with an old TV Guide can check that The Manchurian Candidate played on CBS during its Fall Season. As for Suddenly, the film, also released by Unite Artists, fell in public domain. Therefore, Sinatra and other U.A. shareholders lost any control they might have had. 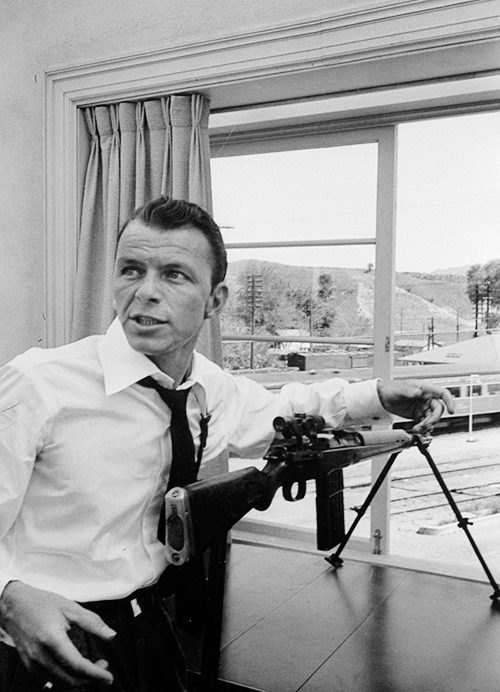 Sinatra over the years has made claims that he was somehow responsible for it withdrawal. (1) As any film buff knows, public domain copies of Suddenly have popped up over the years, sometimes even a horrendous colorized version. It’s been written that Sinatra learned in 1970 that Oswald saw Suddenly on TV just days before the assassination. 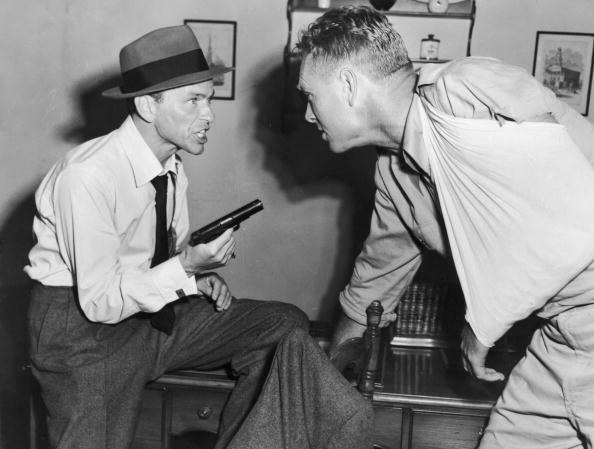 According to Anthony Summer’s Sinatra: The Life, research has shown Suddenly was not shown on TV during this period so Oswald could not have seen the film at the time. 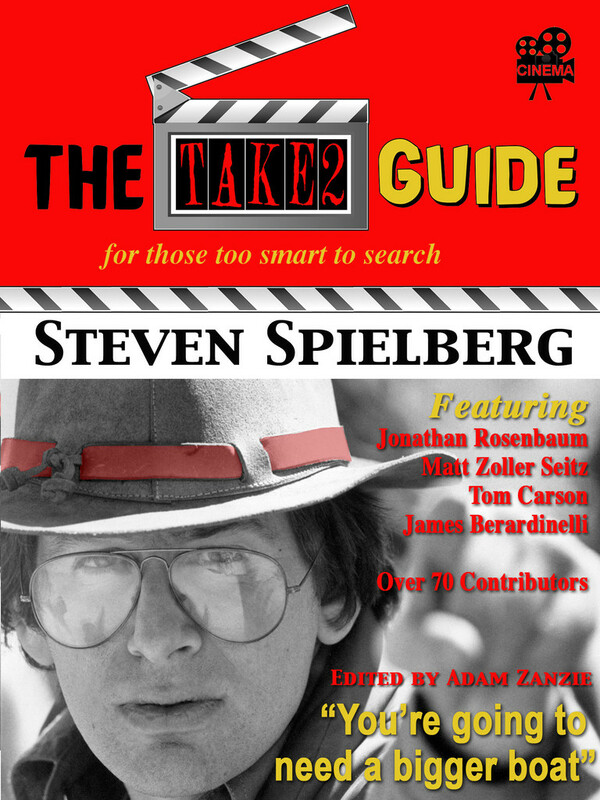 Sinatra in Hollywood author Tom Santopietro quotes Sinatra chronicler Daniel O’Brien as saying that Frank “still shocked by the episode and solely turning more conservative, felt that such inflammatory material should not be in the public domain and withdrew Suddenly from circulation” Santopietro goes on to say, “as a result, there were no further network television showings, and this ban was not lifted until the late 1980’s.” I am assuming here that what Sinatra withdrew were the master copies of the film. What Frank could not control were the bootleg copies of the film that were put out as cheap public domain copies of which he and U.A. lost all control. Watching Suddenly, one does see similarities between the film and the real life assassination particularly with the angle of the rifle that Baron and his men set up at a window aiming it at a downward angle similar to the position Oswald’s rifle would have been at the Book Depository Building in Dallas. Of course, it’s a coincidence, but at time in the sixties, an eerie one. Suddenly is a good thriller, but it’s not perfect. For example, you would think the CIA would have checked out the town prior to the day of the President’s arrival. Old Pop, a former CIA agent should have been more suspicious of Baron and his men when they claimed to be FBI agents. He does question it and Baron gives him an answer that they would helping the CIA out. He should have known better. Marlon Brando was offered the part and originally declined. Other actors were considered including Paul Newman, John Garfield, Montgomery Clift and Sinatra. Brando reconsidered after some “persuasion” by producer Sam Spiegel. 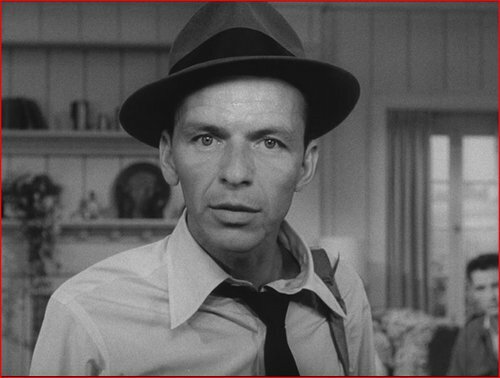 This entry was posted in 1950's, Frank Sinatra and tagged Frank Sinatra, Lewis Allen, Sterling Hayden. Think I caught this once on TV long ago. It’d be good to see it again. Thanks, John. Thanks! It will be on getTV on May 23rd. You should check listings if you get the station. Not a bad film at all and Sinatra is excellent for sure and I enjoyed your commentary. I certainly saw it may times on tv during the 80’s and 90’s, including that that lousy colorized version you refer to. Thanks Bill! The first time I saw this was many years ago and I finally caught up with it again. I stay away from colorized. I’m curious as to how you are using images from the Getty Archives royalty free? I thought you had tp pay them a fee per image. I’m completing a manuscript on James Dean now, and am exploring sources for inexpensive but good quality photos. Peter, my understanding is commentary and criticism are covered by Fair Use. I found the photos on another blog. Looking forward to you James Dean book.